CresGarurumon is a Beast Knight Digimon. A final form of Garurumon. Unlike ZeedGarurumon, another final form, it's a sub-species of MetalGarurumon taking on a humanoid form. 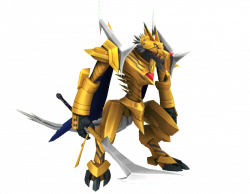 Donning armor made of golden Chrondigizoit that deflects attacks, it excels in swordplay, using the Yellow Beast Crescent Blade. This page was last modified on 13 April 2019, at 14:22.